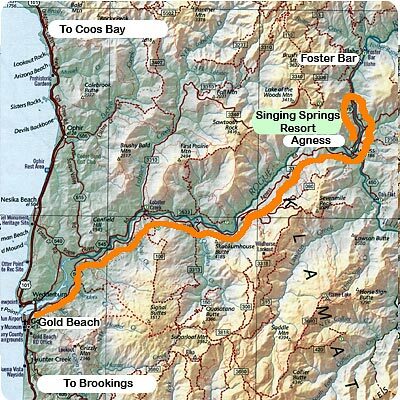 Singing Springs Resort is located on the bank of the Rogue River in Agness, Oregon. But the best way to arrive at Singing Springs Resort is on a commercial jet boat - Jerry's Rogue Jet Boats - upon which you will experience an informative, adventurous river journey. To get here from Gold Beach drive east on Jerry's Flat Road and #33 Agness Road along the South Bank of the Rogue River. Gold Beach to Agness...35 miles...about 1 hour. To get here from Grants Pass in the summer time about 5 miles north of Grants Pass take the Merlin turnoff. Travel BLM Road #34-8-36 and F.S. #23. Approximately 54 miles. Best months are June through September but even in the summer this road is not always open. 2-3 hours driving time.